A work warning form is an HR form or document which is intended for sending a notice to an employee that warns him about his actions, violations, and any forgoing events in the workplace. The form creates a bridge of communication between the HR and the employee, as well as the other members of the company who are involved in evaluating and assessing an employee’s all around wellbeing during his employment. 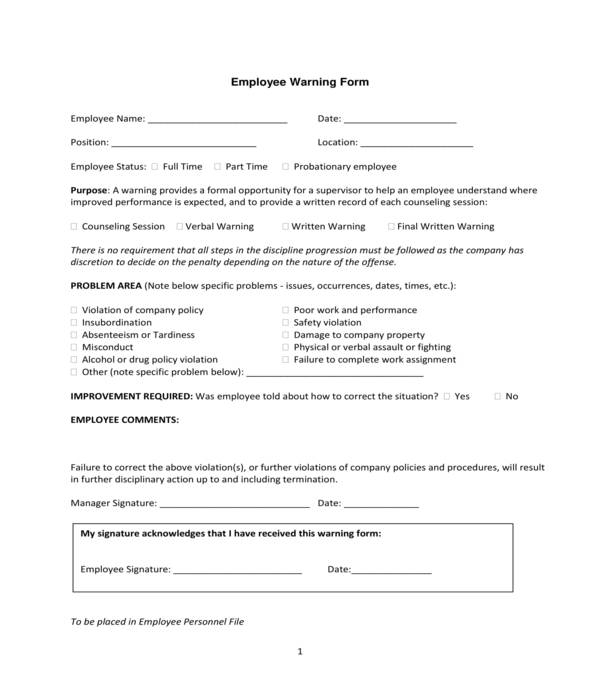 Work Attendance Warning Form – If an employee is almost always late and absent in his workplace, then a work attendance warning form must be served to him. 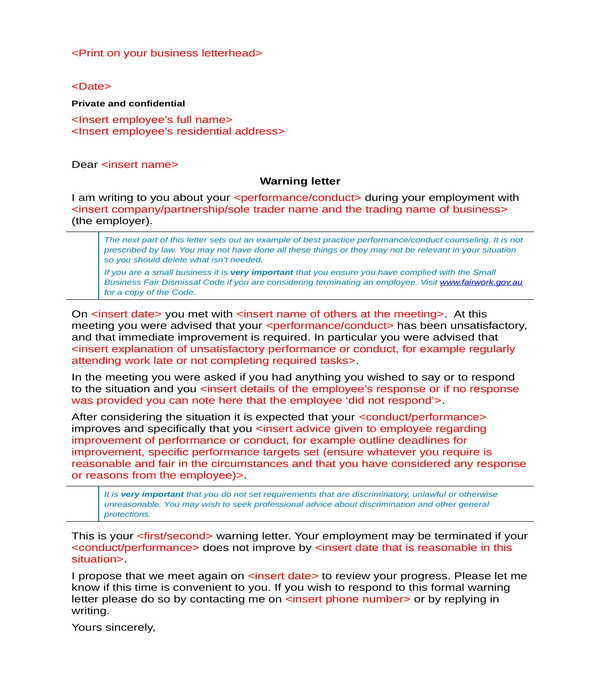 This document type will indicate the explanation of the company towards the purpose of the warning, the actions of the employee that led to the escalation of needing to send the warning, as well as the plans and requirements of the company that the employee must meet to retain his employment. Additionally, the form will also enlist the leave usage of the employee during the six-month employment period. This data will support the work warning. Moreover, the form also specifies the company law which had been violated by the employee and what its corresponding penalty will be. 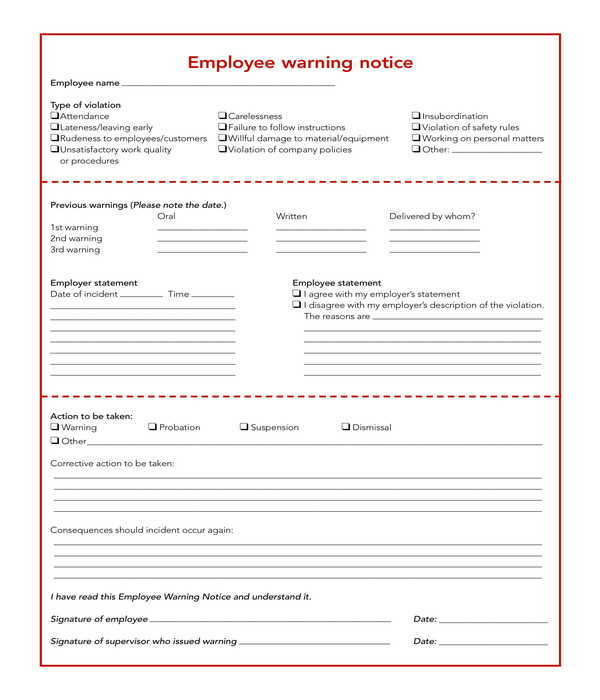 Work Employee Warning Notice Form – There are three sections in this form type. The first section collects the name and the violation of the employee while the second section specifies the previous warnings the employee received and the statements of both the employer and the employee in lieu of the work warning. In the third section of the form, the employer or the HR will need to indicate the actions to be taken for the employee’s violation such as either putting the employee in a probation or suspension period or promptly dismissing and terminating the employee. The explanation for the corrective action to be taken and the consequences to be dealt with by the employee if so ever he repeats the same violation again will also be stated in the third section of the form along with the signatures of both the employee and his supervisor. Worksite Warning Form – This form is not intended for corporate employees in workplaces rather it is to be used by drivers and train track operators. The purpose of the form is to inform the train operators about the places or worksites where the train may pass by. With the form, operators will be able to know the location, the restricted speed limit, and the hand signallers which can be found within the radius of each worksite. Furthermore, the form contains six items. The first item will be for indicating the location of the worksite through a kilometer measurement. The second item enlists the hand signallers and its kilometer per signal, while the third and fourth items document the worksite locations, line, speed, and the clearance information of the worksite. On the other hand, the names of the parties who issued the warning will have to be disclosed in the fifth and sixth sections of the form. Work Staff Written Warning Form – Staff members are workers who are hired on a contractual basis. And if a staff member fails to meet his work requirements and obligations, the human resource of the company can use a work-staff written warning form to specifically inform and address the violations of the staff member. 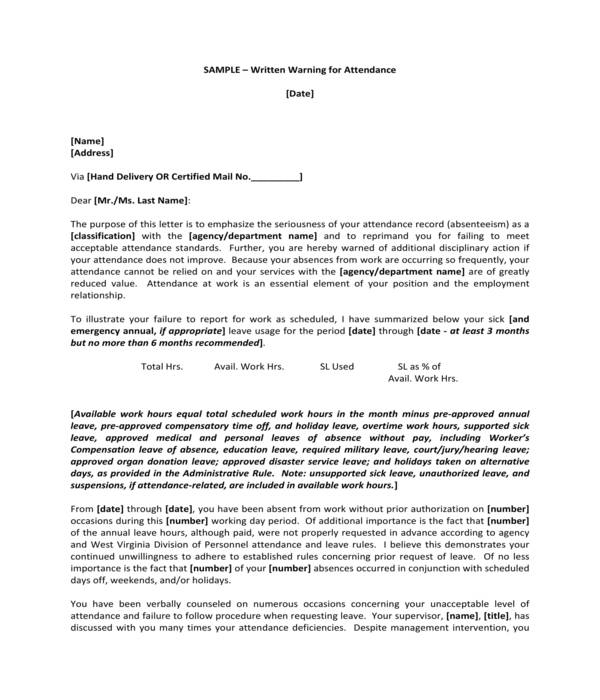 Five sections comprise this form type wherein the first section will state the name of the staff who violated the rules of the company along with the date when the written warning was sent, the name of the staff’s department assignment, and the details of the verbal warnings that the staff recently received from the company. 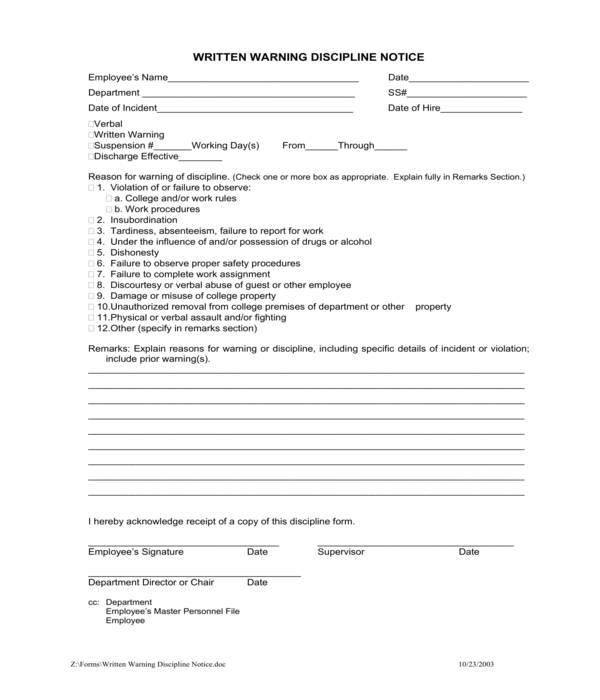 The second and third sections of this warning form specify the types of warning and offense of the staff while the fourth section explains or describes the infraction, consequences, and the staff’s statement about the received warning. 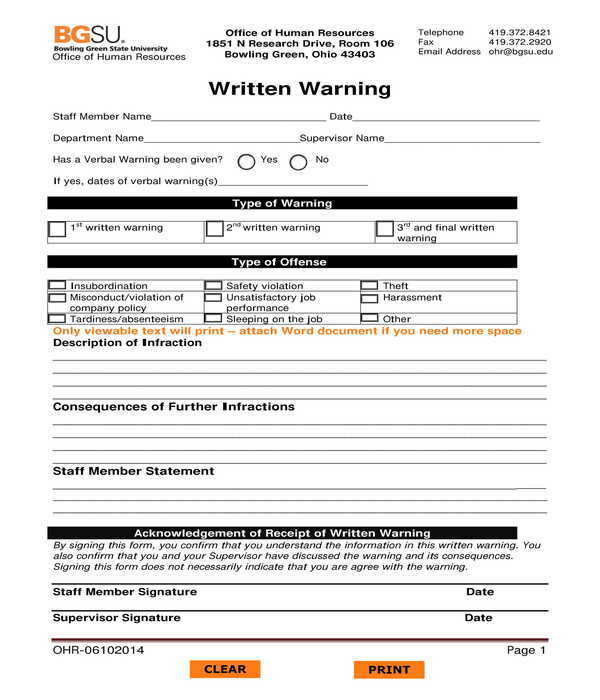 Lastly, the fifth section of the form is where an acknowledgment receipt is incorporated for documenting that the staff have received and confirmed that he understood the contents of the warning as well as his affirmation that a discussion had been conducted by his supervisor about the warning and its corresponding consequences. Work Verbal Warning Form – Compared to the other form types, this document only contains a few entry fields for the user to fill in. The objective of this work warning form is to simply record a proof about the verbal warning given to the staff member or employee of the company. The form will need to be filled out by the employee’s supervisor wherein he must state the employee’s name, the date of the verbal warning discussion, and the incidents which had been discussed with the employee. Work warning forms are only to be acquired from the HR department of the company. To obtain this form, the requestor should be an authorized employee such as an HR representative or the employee’s supervisor. Different companies have varying rules and corrective action procedures which should be followed in requesting the form, however the most common is simply asking for the warning form directly from the HR department and supplying documents to prove the necessity of the form. Explain the details of the issue in the allotted areas of the form: It is important that the work warning form will have the full explanations and the observations of the employer or the supervisor and the HR of the employee. These will allow the employee to be knowledgeable about the offenses that he had done which led to the verbal and written warnings. In addition, the employee’s explanations should also be documented in the form to allow the employer to have a recorded statement of the employee in lieu of his work warning. Present action plans: Employees or staff members who have been performing poorly in the company may need more than just a warning but also a plan which can help in retaining his employment. This is why in the form, the user who is sending the warning should know what the employee needs and what the company wants in order to create a sustainable plan which will help both the employee and the company. Lastly, work warning forms should be documented after it is used. A photocopy of the original warning form should be kept by the supervisor and the employee even after the plans had been met and after the employee’s termination.